Jump City’s officially licensed Looney Tunes Bouncer House with Bugs Bunny, Daffy Duck, Sylvester the Cat, Wile E. Coyote, the Tasmanian Devil, a free-flying Tweety Bird and other friends are ready to show kids how to bounce in this crazy, fun-loving Looney Tunes jumper themed unit children love. It is so much fun to see their delight when they see their favorite characters prowling and playing together with their friends. 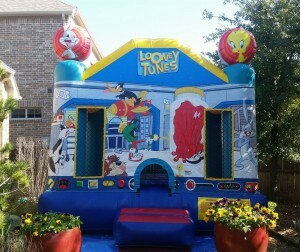 Call today to book your TX bounce house rental for a child you love! This bounce house will keep your children entertained for hours on end! This Air Castle is one product in a fantastic line of themed bounce houses delivered to Plano, Dallas, Frisco and a stadium full of other Texas Cities, like YOURS.